Loving: that my son is sleeping soundly next to me. He's had a rough couple of days because of his tummy troubles so I'm glad he is finally able to get some rest. Reading: Just finished reading Matthew and Proverbs. We get to read the latter every month in the plan I'm doing which I love. Just wrapping up with Genesis because I got a bit behind and about to begin in Exodus and Acts. Continuing on in Psalms. I'm also about to start reading The Power of a Praying Wife by Stormie Omartian. Listening to: Benjamin's Sleep Sheep, Lamby, and Steven Halpern's Comfort Zone. See, here. 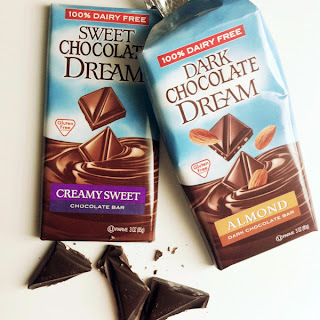 Eating: these Dairy Free Chocolate DREAM chocolate bars my mom bought me a couple of days ago. So far I've only tasted the almond one but I like it. Saw Benjamin's doctor for a followup today. We're putting me on a stricter diet. I've been off of dairy for 3 weeks. We're now adding beef, eggs, and soy to that. I'm looking into getting on a whole foods diet. Looking forward to: so many things this month starting with moving to Atlanta on the 5th and making a home with my new family! Making me happy: All of the above.